ByRominaPerez: Miniature books are grandeur! 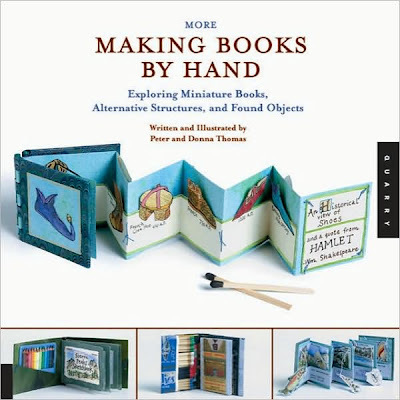 This books contains such beautiful ideas on making miniature books, but not into your usual open and flip pages. EAch piece has a unique way of opening and each piece is an unique piece of art. I love how the authors/ book designers incorporate illustrations in their work. They also show you how to recycle materials to make your books, per example an old camera, matchbooks, old maps and even toys. The first section of the book introduces you to techniques, phrases and the tools you need for bookbinding or book arts. The instructions are easy to follow Thanks to the good writing, illustrations and photographs. You can also peek through google books,just click HERE. Now because I think is worth it, I want you to read about the artist info, taken from this same book. If you still not convinced go check out their website by clicking HERE. If you are still not convinced then, I'm sorry but you are a dummy. If you are offended by me calling you a dummy (but seriously no one gets offended by that word, but there's always that one person, right? ), its nothing personal.